The immediate past deputy governor of Ekiti State and Peoples Democratic Party (PDP) governorship candidate in the last Ekiti governorship election, Professor Kolapo Olubunmi Olusola, has implored Ekiti people and people resident in the state to come out enmass on Saturday to vote for Alhaji Atiku Abubakar and all the PDP national assembly candidates. “Reject All Progressives Congress (APC), reject President Muhammadu Buhari and APC national assembly candidates,” he said. 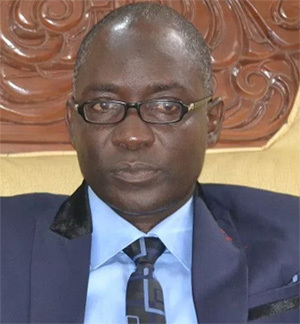 The former deputy governor, who stated this in Ado Ekiti on Tuesday through a press statement issued by his media aide, Mr Onaopemipo Akinloye, said the people needed to end tyranny, anarchy, fascism, insecurity, hunger, economic stagnation, hunger as well as the directionless policies of the ruling APC government with their vote. Olusola urged the people to come out like a Spartan soldier, very resolute to vote for Atiku Abubakar whom he said has the experience to institute a responsible and responsive government which will restructure the country and fast forward the country’s economic and political development. He told Ekiti people not to forget the sins of the Buhari presidency against the State, such as withholding legitimate funds belonging to the state for political reasons during the immediate past PDP administration of Ayo Fayose just to starve the innocent people. “This uncharitable attitude of the Buhari administration caused the Fayose administration to owe four months workers salary”, he said. Olusola also accused Buhari of refusing to consider Ekiti for infrastructural development throughout his four years in power because it was a PDP -controlled state. “The state is blessed with abundant solid mineral resources; not withstanding having an Ekiti son superintending over the ministry, none was ever considered for exploration. You can imagine the billions of naira earmarked to explore oil in the North. “I challenge the Ekiti APC that is asking Ekiti people to vote for Buhari to cite what the President has done for the state. Ekiti people are no fools. 90% of the infrastructure in Ekiti was put there by past PDP governors. Olusola implored the people not to sell their votes but that they should protect their votes, refuse intimidation, be law-abiding and shun violence.